When a relationship is going fabulously, the world is a brighter place. Food tastes better, skies are clear and blue and you hum romantic songs under your breath at work. But when things start to go sour, the world seems dark, gloomy and hopeless. You’ll spend the next several months of your life trying to fix the problems in the relationship and agonizing over whether you should just break up or not, only to be left bereft and heartbroken in the end. 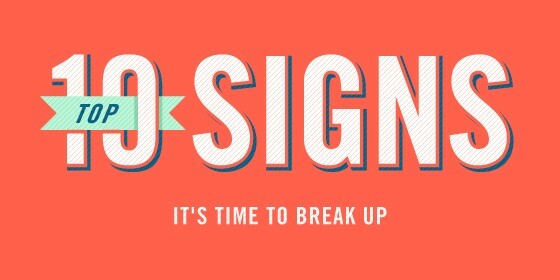 To save you some time, we present the Top 10 Signs It’s Time to Break Up. Not because you love your job. Because you absolutely can’t stand to go home and sit through another episode of “Real Housewives of Atlanta.” How can you be with someone who has such horrible taste in entertainment? Remember when you used to bring her flowers and tickets to the symphony? Now you’ve just stopped trying. When you find yourself wondering if you can get away with wearing your pajama pants to dinner, it’s time to break up. At first, you thought they just didn’t understand his unique sense of humor. He isn’t really a racist, misogynist pig—he just gives that impression. If your friends hate him even more a few months after they’ve met him, it’s probably time to dump him and find a real man. You might be OK if they live in another country. One far, far away. But if she’s joined at the hip with her mamma and idolizes her daddy and you can’t stand either of them, it’s time to do some soul searching. Do you really want to spend the rest of your living days with these people? There was a time when everything he said was witty and wise. Now, he just sounds like an idiot every time he speaks. Did he really lose 100 IQ points after you met him, or is it just time to break up? You used to think it was adorable that she didn’t know the names of the last four Secretaries of State—now, not so much. And those little quirks, like leaving her makeup strewn all over your bathroom counter or refusing to fill up until the car is driving on fumes have become less cute and more pesky. Let’s not even talk about that weird noise she makes when she laughs. The Twilight series was bad. And the stupid movie where the dog gets lost, but battles his way across the country to return to his loving owners was even worse. But the latest Nicholas Sparks movie was the last straw. She’ll either learn to love car chases, explosions and hand-to-hand combat, or she’s a goner. There sure are some hot single guys out there, and your guy just seems to pale in comparison. Look! This one has a PhD in molecular biology, a $400k annual income and abs that look as though they were chiseled from stone. Your boyfriend’s spare tire and “career” as a Starbucks barista can’t compete with that. And promptly fall in love with the therapist. Not only is it time to break up… it’s time to wrangle a discount on that therapy bill.